Chip Somodevilla/Getty ImagesPresident Donald Trump answers questions from reporters on Monday. President Donald Trump said he would only make good on his promise to donate $US1 million to a charity of Sen. Elizabeth Warren’s choice if he can “personally” conduct a DNA test proving her Native American ancestry. His comments came after the Massachusetts Democrat on Monday released the findings of a DNA test conducted by a Stanford University scientist that found “strong evidence” that Warren has distant Native American ancestry. Earlier on Monday, Trump flatly denied that he ever promised the $US1 million. 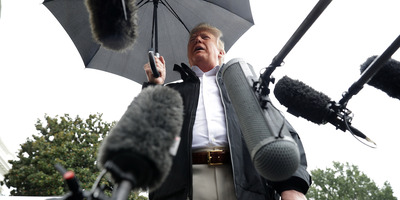 President Donald Trump on Monday said he would only make good on his promise to donate $US1 million to a charity of Sen. Elizabeth Warren’s choice if he can “personally” conduct a DNA test proving her Native American ancestry, a claim that Trump has ridiculed. Trump, who derisively refers to Warren as “Pocahontas,”said at a July rally that he would give $US1 million to a charity of Warren’s choice if a DNA test found that the senator had Native American heritage. But earlier on Monday, Trump denied ever making that promise. “I didn’t say that – you better read it again,” he told a gaggle of reporters outside the White House. The president changed his position later in the day, telling the press during a visit to Florida to survey hurricane damage that the report doesn’t prove Warren’s claims and that he would only trust his own test. Warren’s Senate reelection campaign also created a website that includes family documents and testimonials. The video also includes several of Warren’s former academic colleagues pushing back on another line of attack from Trump and his allies that Warren used her claim of Native American ancestry to advance her legal and political career. In the video, Warren’s former colleagues say her ethnicity was not considered when they hired her to teach at Harvard Law School, the University of Houston, University of Pennsylvania Law School, and UT Austin School of Law. “The people who recruited Elizabeth to her teaching jobs, including Ronald Reagan’s former solicitor general, all confirm: they hired her because she was an award-winning legal scholar and professor and they were unaware of her family’s heritage,”the website says. The senator asked Trump to direct his $US1 million donation to the Indigenous Women’s Resource Center, a nonprofit group that works to protect Native American women and their children from violence.